Have you ever wondered why there are so many different kinds of glasses for wine, champagne and port? Every restaurant or bar has its own selection of wine glasses in a range of different shapes and sizes. Whether you own a restaurant, are thinking of starting your own catering business or you are arranging the catering for an event, it’s important to know which glasses are used where. In this guide, we’ll take a look at the different types of glasses on offer and when they need to be used. Is It Really Important To Choose The Right Glass? A glass is a glass, right? Well, in some cases where water or soft drinks are being decanted into them this would be true, but alcoholic drinks are a different matter entirely. If you were to visit a good quality cocktail bar, for example, you would be amazed at how many glasses are on display around the bar. In fact, most cocktails have their own recommended glass. Flavour is also very important, and certain glasses are said to bring out the best in a wine or champagne. A champagne flute is said to keep the bubbles streaming to the surface in a steady flow, thus improving the sparkle, texture and taste of the drink. Red wine glasses are often wider than a white wine glass allowing the drinker to swirl their wine around to release the aromas and taste. Understanding the different parts of a wine glass will help you to choose good quality glasses and understand how important the glass is to the wine it will contain. ● The base - this is the part of the glass that keeps it supported and standing. ● The stem - this is the part that the guest holds and connects the bowl of the glass to the base. ● The bowl - this is the part that can vary in size and shape quite considerably. It is the part that holds the wine, and you should aim to fill a glass to approximately one third full, or to wherever the bowl is widest. This will ensure the wine’s contact with the air is maximised. Red wine glasses generally have a wider, larger bowl. This ensures that as much oxygen as possible comes into contact with the wine allowing it to breathe and release its complex aromas and flavours. Syrah and Shiraz glasses are some of the smallest red wine glasses. The sharply tapered rim helps to bring out the aromas of the fruit first and then the tannins. Cabernet and Merlot have a stem of average length, a wider base and a wider bowl that allows a lot of oxygen to hit the wine. The more oxygen, the better the fruit flavours and aromas come out. Pinot Noir glasses are designed to direct the intensity of the wine flavours straight to the nose and tongue. These glasses have a stem that is shorter than other glasses, and a wider bowl than any other glass too. The aromas of white wine are much lighter than white wine, and this calls for a smaller and more delicate glass. Chardonnay glasses offer a top that slightly tapers and a wide bowl. It is almost a smaller version of the Pinot Noir glass. Sauvignon Blanc glasses have a narrow bowl and a longer stem. The slim and tall design of the glass ensures easy detection and appreciation of the wine aromas. The amount of oxygen to the glass is also minimised helping to keep the wine fresh and cool. Riesling glasses are narrower and taller than traditional Chardonnay glasses. The tapered design of this type of glass ensures guests can focus on the intense fruity aromas at the top of the bowl. The long stem also helps to keep the wine cool. Champagne glasses, or flutes, are the perfect shape to deliver bubbles and liquid directly to the tip of your tongue, and also to keep the bubbles from dispersing too quickly and making the fizz go flat. The narrow flute is perfect for Champagne, Prosecco and other sparkling wines. If you are serving vintage champagnes or planning a vintage event, a wider bowl is often preferred. A wider bowl will allow the more complex flavours to come through. The wider base also helps to keep these glasses stable. However, these wider glasses are most likely to cause bubbles to dissipate quickly. Crystal Or Glass? Is There A Difference? It might surprise you, but the material of your wine glasses matters too! If you are looking to really impress your guests, lead-free or leaded crystal is the only choice. Crystal causes light to refract, giving your glasses a shimmering sparkle that looks highly sophisticated and will show your wines in their best light. However, these glasses can often be very delicate, and washing over time can make them appear cloudy. If you are opting for glassware, look for clear glasses as frosted glasses can obscure the wine’s appearance. Experienced wine drinkers can tell a lot by the colour of a wine, and will appreciate a clear glass. Trends come and go, and the same applies to glassware, but you will usually find that tradition wins through where wine is concerned. By investing in a good set of glasses that are matched to the wine you will be serving, you can be sure your guests will enjoy your wine at its very best. 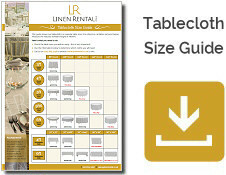 Here at Linen Rental, we appreciate good tableware and glassware as it is the perfect complement to our high quality linens. A beautifully set out table with elegant glassware and crisp linens will truly set out your event or establishment apart from the rest, and is so easy to achieve with our linen rental services.